The new McLaren 650S will officially debut at the Geneva Motor Show in a couple of weeks, but here it is nice and early and looking like a P1 crossed with a 12C. 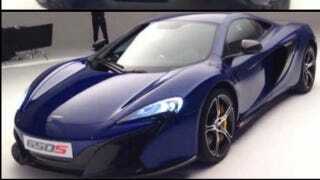 What, exactly, is a McLaren 650S? We think it's a more powerful version of the 12C with 650 horsepower, which means it sort of slots in between the 12C and P1 (although, it seems, this might be a future iteration of the 12C). Either way, bask in it until it debuts.